Gunmen Dump 35 Bodies At Rush Hour In Mexico A gang known to be aligned with Mexico's most-wanted drug lord appears to be making a violent challenge to the dominant cartel and Mexican officials in the Gulf state of Veracruz, dumping 35 bodies on a busy avenue in front of horrified motorists. Mexican authorities guard the site where 35 bodies were found beneath an overpass Tuesday in Boca del Rio in Veracruz State. A gang known to be aligned with Mexico's most-wanted drug lord appears to be making a violent challenge to the dominant cartel and Mexican officials in the Gulf state of Veracruz, dumping 35 bodies on a busy avenue in front of horrified motorists near where the nation's top prosecutors were about to start a convention. The cartel known as the New Generation unloaded the bound, seminude, tortured bodies during rush hour Tuesday as part of a several-month campaign to take the strategic port of Veracruz now controlled by the Zetas drug gang, an official in the Mexican armed forces told The Associated Press on Wednesday. All 35 victims, who included 12 women and two minors, were linked to the Zetas cartel, said the official, who couldn't be quoted by name for security reasons. It was the first official acknowledgment of who may have carried out the attack after a banner left at the scene threatened the Zetas and bore the initials "G.N." A U.S. law enforcement official said the New Generation is believed to be linked to Joaquin "El Chapo" Guzman, widely considered the world's wealthiest drug trafficker. But the U.S. official, who also could not be quoted by name for security reasons, said it would be surprising to see heavy involvement in Veracruz by Guzman or his Sinaloa cartel, which is based in the Pacific coast state of the same name on the other side of Mexico. "We don't have anything that corroborates or disputes" that the body dumping was linked to Guzman, the U.S. official said, adding that other sources say the Gulf Cartel could have been responsible. "Sometimes these criminal groups blame the other guys." Horrified motorists grabbed cellphones and sent Twitter messages Tuesday warning others to avoid the area where the bodies were dumped near the biggest shopping mall in Boca del Rio, part of the metropolitan area of Veracruz city. The gruesome gesture marked a sharp escalation in cartel violence in Veracruz state, which sits on an important route for drugs and Central American migrants heading north. The Zetas drug cartel has been battling other gangs for control of the state. Veracruz state Attorney General Reynaldo Escobar Perez said the bodies were left piled in two trucks and on the ground under the overpass near the statue of the Voladores de Papantla, ritual dancers from Veracruz state. He said some of the victims had their heads covered with black plastic bags and showed signs of torture. Most of them were asphyxiated or beaten to death, and one had been shot. Among the bodies was a local police officer who had disappeared two weeks ago, Escobar told W Radio in Mexico City. Two teenage boys, ages 15 and 17, were also among the dead. Police have identified 32 of the victims so far and maintain they all had criminal records for acts such as murder, drug dealing, kidnapping and extortion and were linked to organized crime, said Magda Zayas, spokeswoman for the Veracruz Attorney General's Office. State Gov. Javier Duarte said on his Twitter account "the killing of 35 people is deplorable, but it's even more deplorable the same victims chose to extort, kidnap and kill." Duarte said an intelligence database shows the 35 victims had criminal backgrounds. 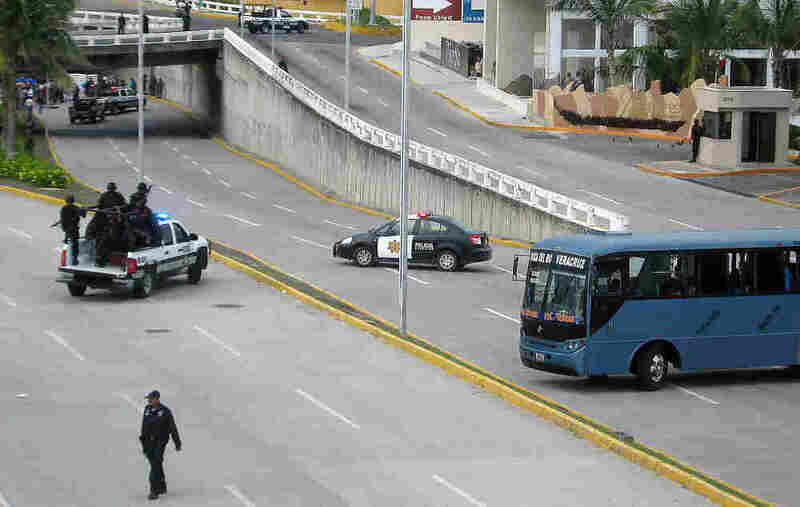 Motorists posted Twitter warnings that said the masked gunmen were in military uniforms and were blocking Manuel Avila Camacho Boulevard. "They don't seem to be soldiers or police," one tweet read. Another said, "Don't go through that area, there is danger." Veracruz is currently hosting a conference of Mexico's top state and federal prosecutors and judiciary officials. Local media said that 12 of the victims were women and that some of the dead men had been among prisoners who escaped from three Veracruz prisons on Monday, but Escobar denied the escaped convicts were among the dead. More than 35,000 people have been killed in Mexico in drug-related violence since President Felipe Calderon declared war on the cartels in December 2006. Addressing the General Assembly of the United Nations in New York on Wednesday, Calderon said violence in Mexico is being fueled by the insatiable global demand for narcotics. He said drug-consuming countries have a moral obligation to reduce the huge profits criminal groups make each year on the narcotics trade. According to various estimates, it's a market worth between $15 billion and $30 billion a year. Calderon stopped short of explicitly calling on the U.S. to legalize drugs, but said rich nations must consider "all options" to undermine the economic power of these brutal criminal organizations.